So many babies traveling the world! Here is another post in the #BabysFirstTrip series. 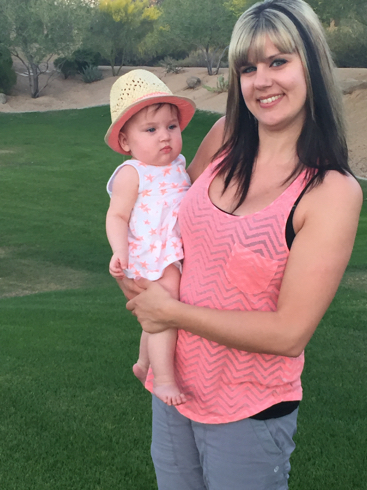 Check out Krystal, Chris, and Baby Addie’s first trip experience. Find out more about how they took the plunge and agreed to get bumped from their flight! 1. Where did you go and what was the purpose of your travel? 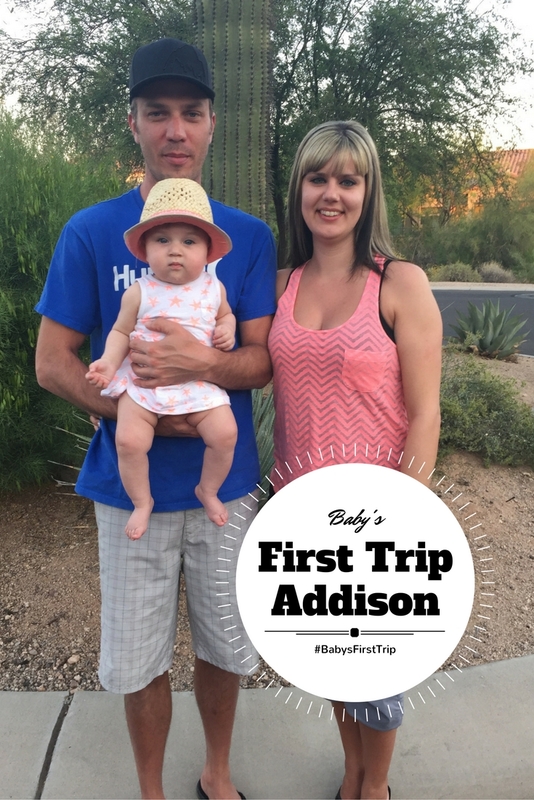 We traveled to Mesa Arizona with our 6-month old baby girl Addison (Addie) for a family vacation with my husband’s family. 2. What was the best and/or worst part of the flight? The best part of our flights was how well Addison did. I was unsure at the time and nervous of how she should fly being we had to be at the airport at 5 in the morning. The first flight wasn’t full so we had lots of room which was a really nice plus, she slept the whole way to Calgary, Alberta. The worst part for us would have to be the second flight it was a little cramped, full and super-hot, which made breastfeeding her a little more difficult as we were both getting uncomfortable. But in the end we made it through, she didn’t get too fussy. She also made friends with the gentleman sitting beside us. Addie always had to tap him on the shoulder while Chris was holding her. He was super friendly & didn’t mind at all which eased my mind as some people can be not so understanding of little ones. At the end of the day, I think flying was harder on us than her. 3. What was the easiest thing that you least expected while traveling with a baby? How well she adapted to everything, I didn’t know what to expected when traveling with a little one, I was definitely nervous at first on how well she would travel, but to my surprise, she did really good. 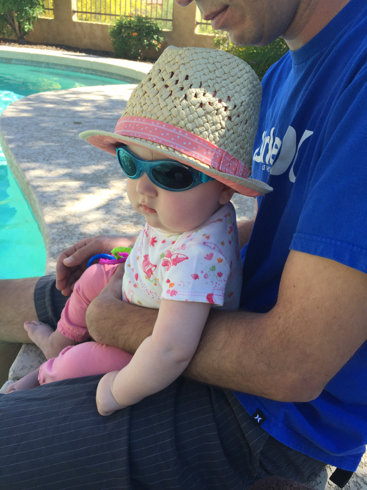 She didn’t freak out on the flights and quickly adapted to her environment when we arrived in Phoenix. Overall traveling with Addie was just as easy as traveling when it was the two of us, just a lot more stuff that had to come along. 4. 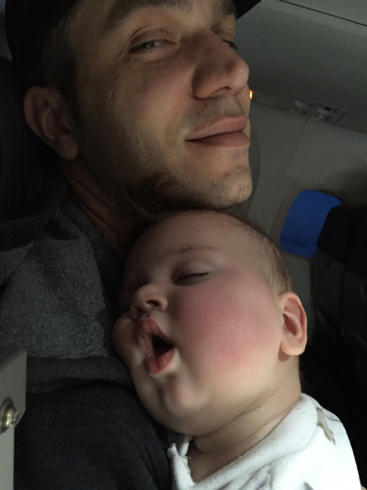 What was the most challenging part of traveling with a baby? I would say the most challenging part of traveling with a baby is packing for them, trying to remember every little thing, But we did it and didn’t leave anything behind. As well getting thru security was a bit of a challenge with a little one. On the way home our flight had been oversold, which was what we were hoping for as we were not ready to leave. We got to stay an extra day, got a voucher for free flights, so really we got paid to be bumped off our flight. The only problem is I was pulled in for a secondary screening both times we were at the airport so my husband had to gather everyone’s belongings while I was searched. They said there was an organic matter on my hands which we could not figure out if it was something from the baby or not. 5. What is the best thing you brought for baby (or parent) on the trip? I am not sure there was just one thing that we brought that was the best thing. But our iPhone was a life saver when driving, to play a show when she would get fussy, going to a large city when it takes an hour to get anywhere its hard on her. 6. Based on your first experience traveling with a baby, are you ready to book another trip or are you going to wait a bit? Where do you think you will go? Yes, I would defiantly travel again with Addie. We had so much fun as a family traveling together, it was easier than I ever thought. Next, we are going to try a long road trip with Addie and our pug Kali to Vernon, BC. With some stops along the way of course. 7. Do you think you will travel more or less after having a baby? Why do you feel that way? I think we will travel as much as we did before baby. Nothing has really changed just that we have one extra little person traveling with us (and a lot more luggage). As a kid, I got to travel with my parents on hot holidays and I want my daughter to experience what I did as a kid. 8. What would be your one piece of advice to new parents about traveling with an infant? One piece of advice I would give to new parents is taking your time when traveling with a little one. I found if we were calm & relaxed Addie was also calm & relaxed. It makes traveling a lot easier & enjoyable with your little one. 9. 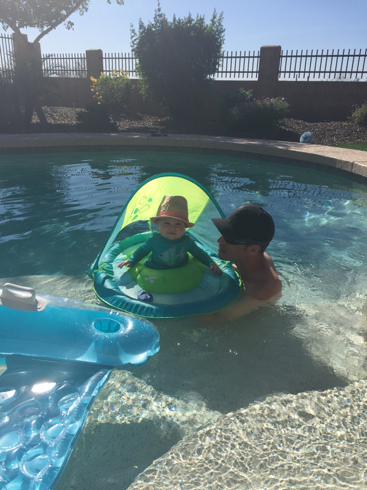 Do you think the memories of this first trip will be constantly retold for him to learn about as she gets older? Yes most definitely! I know she will love to hear the story of her first trip as we will love telling it to her. 10. Funniest or most memorable part of the trip with baby? I think the most memorable part of our trip was the whole trip. But if I had to pick one it would be watching Addie and her cousin Isabel (who is 3 months old then her) getting to experiencing all of this together. Thank you so much to Krystal & Chris for sharing your story with The Passport Kids readers. I loved how you both went with the flow and even took a later flight to get one more day on your trip! Love it! I also absolutely love Addie’s hat in the pics, such a styling little girl! 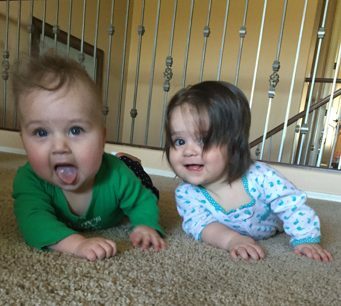 Would you like to share your #BabysFirstTrip with the readers of The Passport Kids? If so, send me an email at nicolejamie@thepassportkids.com to share your story to inspire and help other first-time parents take the plunge with the first trip.